we must get tickets for next year!! Anyway jokes aside what is SAFER upto? This update has just arrived and explains Peter’s fascination with Peanut Butter. Peanut butter and voracious rats are not usually what springs to mind when the conversation turns to wildlife hotspots, but these unlikely partners are central to a conservation project currently underway in the Falkland Islands. Working on four small islands in the western Falklands, SAFER (SubAntarctic Foundation for Ecosystems Research) is striving to ecologically restore the land and improve it as wildlife habitat. The rats are one of three species of introduced mammals that are causing havoc with the native flora and fauna (mice and rabbits are the other culprits). Accidentally introduced to these bird-rich islands when farming began in the 1800s, rats have thrived on the native birds, insects, and plants, which have evolved in the absence of ground predators. The Falklands have no native trees so most bird species are ground nesters, and hence their eggs and chicks are very vulnerable to predation by such opportunistic omnivores. SAFER plans to eradicate these pests – ! After first studying their ecology and behaviour. And that’s where the peanut butter comes in. Rats love peanut butter so it is used as bait in the traps set as part of the research. SAFER Director, Peter Carey, is currently working on the island and reports that the rat population seems to have increased dramatically since last year. The exact cause is not known for certain, but it may be linked to the influx of a large colony of South American terns which moved onto the island for nesting in January 2008. Over 4000 nests were counted, and it is likely that many of their chicks and eggs have fueled a population explosion of rats. Studies such as these will help us better understand the impact of these introduced pests, and make it easier to remove them from the ecosystem, thereby allowing the native species to flourish. Peter is a zoologist who has made over 70 trips to Antarctica, including research expeditions as a scientist with the New Zealand Antarctic Programme and the Australian National Antarctic Research Expedition. In the course of conducting research on such varying topics as penguin behaviour, fish physiology, seabird ecology, and the social behaviour of seals, Peter has acquired an extremely broad knowledge of the Far South. 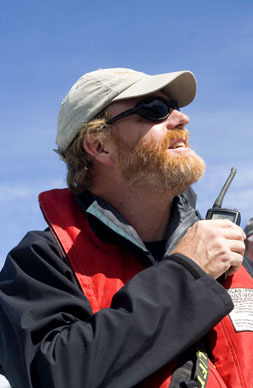 He is an Affiliate Professor with the Geography Program at the University of Alaska, and the co-author, with Craig Franklin, of the Antarctica Cruising Guide. Dr Carey continues to visit Antarctica each summer, and is also working to ecologically restore a group of small islands he has purchased in the Falklands archipelago. As the Director of the SubAntarctic Foundation for Ecosystems Research (SAFER), a non-profit conservation organisation, Peter is actively involved in improving the wildlife habitat on these islands.